CeraVe Intensive Stretch Mark Cream is a nourishing, and repairing formula fully charged with great aromas, and bundles of active ingredients. Here is our review after a 12-week course of treatment. This product is immediately impressive. It comes packaged especially to protect the sensitive ingredients within, formulated to treat your skin and to combat the ageing process. As with all stretch mark products, buyer beware. There are still no scientific guarantees that any product applied to the skin can “fix” stretch marks. The ingredients list included in CeraVe Intensive Stretch Mark Cream is award winning, and features the very best of dermatological technology. There are plenty of natural oils, and MVE technology allows your skin’s cells to better hydrate your cells. Plus a dose of hyaluronic acid helps to retain the natural moisture of your body. Hyaluronic acid and oil really is the hottest thing in skincare right now, be sure to check it out. Note this product is free of any Parabens or Phthalates, and so caters well to more concerned customers. Finally, Ceramides are added to help with your body’s normal protective duties, to make sure your skin can nurture itself into the future. Make sure to apply this cream to the entire affected area, as well as other areas which are high risk for future development. You are advised to always apply after washing the area to be sure that only the cream sinks into your skin, and not any dirt picked up through the day! Twice per day is their recommendation, though applying liberally in the morning did the job for me. Though there are no known side effects, always be sure to check labels, particularly if you suffer from allergies. 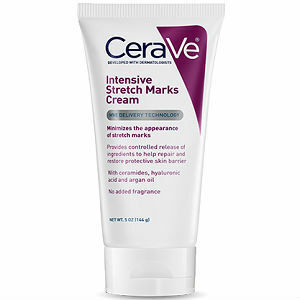 At only $20, the CeraVe intensive stretch mark cream is a really great value. Coupons are also available so be sure to check out their site to get the most for your money. Note that the pot is quite small, only 5 oz, but you will start to see the benefits before you finish your first little tube. Unlike many cosmetic products, no guarantee is offered by CeraVe on this product. This is a real shame, though all I would say is that the product is great value for money, so you needn’t fear too much. The formula by CeraVe is award winning for it’s organic and natural ingredients list. It isn’t just what it does include though, it’s the things they leave out (including parabens) which are the strengths of the CeraVe product, and make it a popular choice for expecting mothers. Two things to note are that the product seems to function more in a preventative way, rather than offering much healing quality. Plus it’s a real bummer that they don’t offer a guarantee. As a result, you might be better off doing a little searching for the perfect stretch mark cream before committing to this purchase. David Carney	reviewed CeraVe Intensive Stretch Mark Cream	on August 4th	 and gave it a rating of 2.5.